In the playoffs, the Bulls lost only three games in four series, defeating Gary Payton, Shawn Kemp, head coach George Karl and their Seattle SuperSonics in the NBA Finals to win the NBA Championship. The Bulls shot out to a 3-0 lead, but the Sonics rallied back to win the next two at home. Eventually, the more experienced Bulls proved to be too much as the Bulls captured their fourth title (after a two year hiatus). For his performance in the series against Seattle, Michael Jordan was named the Finals MVP. Michael Jordan decided to return to basketball in 1995, after a short stint as a baseball player. Although he failed to lead the Bulls to the Finals in that year, he returned to pre-retirement form the next year and led the Chicago Bulls to one of the most memorable seasons ever. Freshly motivated by the playoff defeat against the Orlando Magic, the Bulls trained aggressively in preparation for the 1995-96 season. In the offseason, the Bulls lost B.J. Armstrong in the expansion draft, but Bulls general manager Jerry Krause pulled off a masterful deal by trading Will Perdue to the San Antonio Spurs for notorious rebounder Dennis Rodman, who had won the past four rebounding titles. 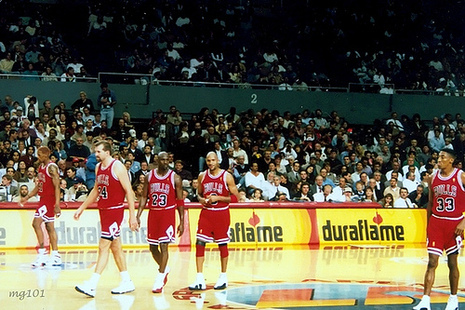 That year, strengthened by the addition of Dennis Rodman, the Bulls dominated the league. 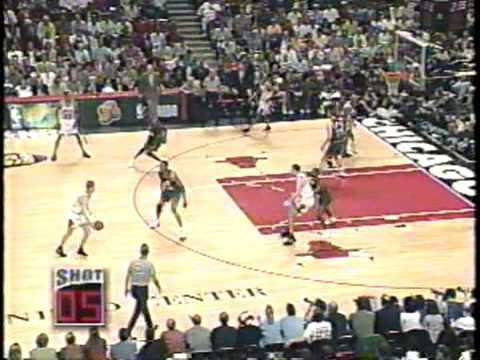 With a lineup of Ron Harper, Michael Jordan, Scottie Pippen, Dennis Rodman and Luc Longley, and perhaps the league's best bench in Toni Kukoč, Steve Kerr, Jason Caffey, Bill Wennington and guard Randy Brown, the Bulls posted one of the best single-season improvements in league history and the best single-season record. They moved from 47-35 to 72-10, which remains the best record in the league for an 82-game season. Jordan won his eighth scoring title, and Rodman his fifth straight rebounding title, while Kerr led the league in three-point shooting. Michael Jordan won the league's regular season and All-Star Game MVP awards. Jerry Krause won the executive of the year award, Phil Jackson won the coach of the year award, and Toni Kukoč was the sixth man of the year. Both Scottie Pippen and Michael Jordan made the all-NBA first team, and Jordan, Pippen, and Dennis Rodman all made the all-defensive first team, the only time three players from the same team had done so. The Chicago Bulls had no problems during the playoffs. After demolishing Miami by over 15 points per game in the first round, they would go 4-1 against the Knicks in the semifinals to get revenge and sweep the Magic in the Eastern Conference Finals. In the 1994 playoffs, the first seeded Seattle (63-19) lost 3 games to 2 to the eighth seeded Nuggets (42-40). Seattle would once again be upset in the 1995 playoffs against the L.A. Lakers. After two first round defeats, Seattle would make a major come back in the 1996 season that would give them the name Sonic Boom. Led by Gary Payton and Shawn Kemp, the SuperSonics went 64-18, leading the Western Conference, and setting the record for highest single-season win total in Supersonics history. Seattle blew through Sacramento in the first round; 3 games to 1. It also had no problems with defending champion Houston, sweeping them as well. However, their playoff troubles re-emerged after dropping two games to the Utah Jazz to bring the series to 3-3. However, Seattle took game 7 and won what was one of the most exciting series of the 1996 playoffs. Seattle would finally go to its first NBA Final game since 1979. Michael Jordan collapsed in the locker room and cried. In leading the Chicago Bulls to their fourth league championship in six years, his return to the NBA mountaintop was complete. He had regained his status as the sport's premier player. But Chicago's six-game elimination of Seattle in the NBA Finals was more than a validation of Jordan's determination and skill. It was the fitting ending to an historic season. 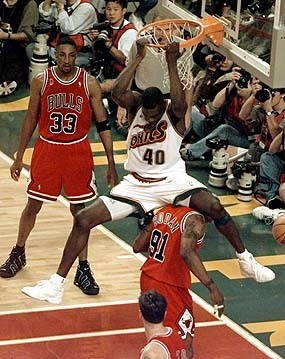 The Bulls, led by Jordan, Scottie Pippen and Dennis Rodman, set an NBA record by going 72-10 during the regular season. They blew past Miami, New York, Orlando and Seattle in the playoffs, losing just three games. Chicago's combined record of 87-13 cemeted its claims as one of the best teams ever to take the court.